For our honeymoon, Tejas and I went to South Africa and the highlight of food on the trip for me was this Cape Malay curry they served at a restaurant on the Cape Town Waterfront. It was tomato based, sweet, tangy and very spicy!!! It was served with what I think of as Malaysian style paratha (super flakey and buttery!). WOW! I tried other versions of Cape Malay curry on the trip that were also good, but this one was especially yummy. So began my quest to find out about Cape Malay cuisine. The Cape Malay community is an ethnic group in South Africa that has origins in what today is Indonesia. The food, at least the curries, are incredible! Each Cape Malay curry is different. They can be tomatoey or yellow, spicy or mild, etc. Key ingredients tend to be apricot jam and vinegar. I started making this dish when we first got back and used random spices that felt right. This time I found a recipe for Cape Malay curry powder and it worked fantastic! This served 5 people, but just barely. Next time, I will have to make more so we can have leftovers! We had it with yellow rice. Heat oil in a medium stock pan and cook onions until they are very translucent, adding the garlic, ginger, and green chilis part way through cooking. Add the Cape Malay curry powder, coriander and chili powder and cook for another minute or two. Add the tomatoes and cook until a paste forms. Add the tomato paste, vinegar, apricot preserves, salt, and a little water. Blend a little with an immersion blender to get a nice gravy (doesn’t need to be smooth). Add green beans and cauliflower and more water, cover and cook until tender. Meanwhile boil the carrots until tender (I put them in a bowl of water and microwave for a few minutes). Add carrots and peas to the curry and cook until the peas are cooked through and all the flavors meld. Serve with Malaysian style paratha, yellow rice, and yogurt. 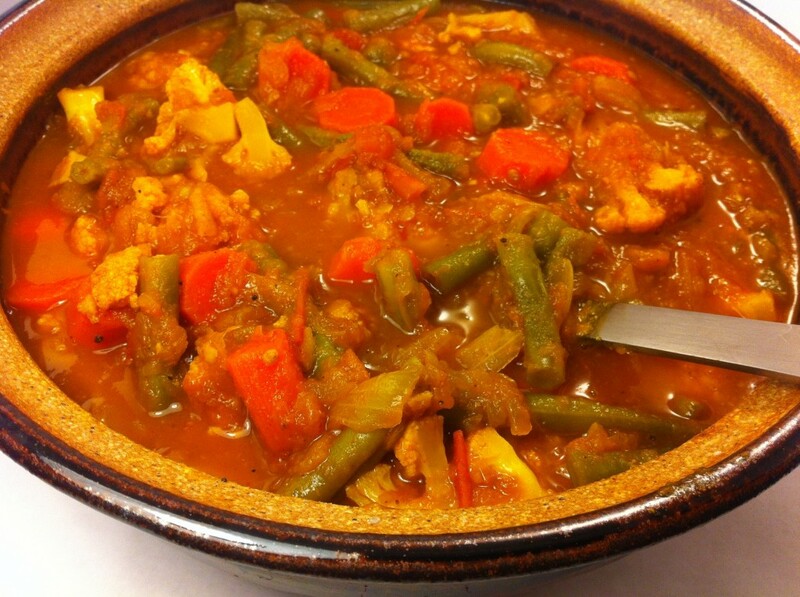 What a great recipe for Cape Malay vegetarian curry.